There are many types of pottery clay that can be used for a clay body or a specific composition of clay. Clay bodies are grouped into three categories: earthenware, stoneware, and porcelain. Each group represents different characteristics, such as workability, firing (or maturity) temperature, and porosity. Ask yourself some basic questions to determine which clay body is best for your type of pottery and projects. What Type of Pottery Do You Do? 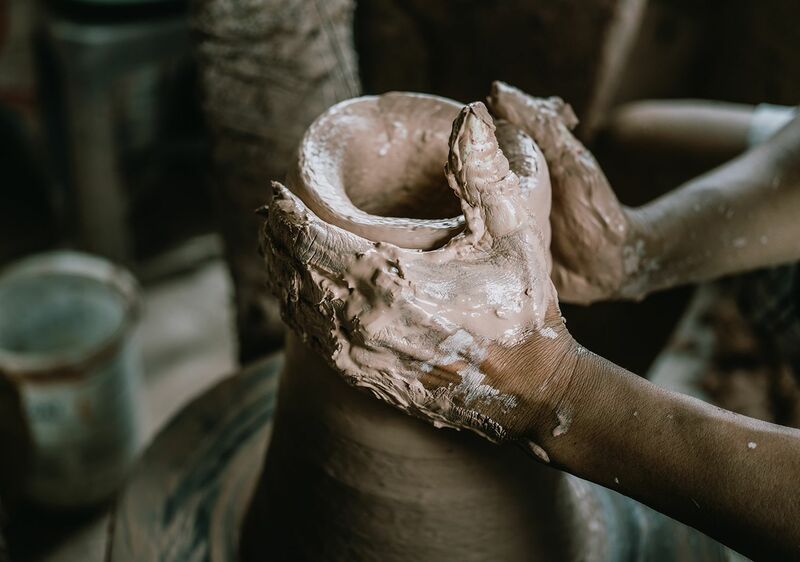 The type of pottery you want to create has a big impact on the clay body you choose. For example, some clay bodies are great as throwing clays but would be a disaster as a hand building clay for an outdoor piece. You may find that you want to use more than one clay body, and this is often the best solution. What Equipment Is Available to You? The three main pieces of equipment for potters are those for processing, shaping, and firing. Whether you have access to any or all of these will affect what type of clay you might use. Do you own a kiln? Can you rent a kiln? Do you have access to kilns through classes? To What Temperature Will You Fire? Buy Moist Clay Body or Mix Your Own? Commercially available moist clays offer a very convenient way to buy clay if you don't have the machinery to mix it yourself. This is especially true of the clays that are processed using a de-airing pug mill, which eliminates a lot of the work of wedging the clay. Mixing clay yourself offers a couple of advantages. The first is economic: moist clay weighs a lot more than dry clay, and this is reflected in shipping costs. The other advantage of mixing your own is that you can use custom clay body recipes and modify them as desired. One of the best ways to find a clay that is perfect for your needs is to experiment with various clay bodies. Try buying individual bags of several varieties of clay that seem to be what you're looking for. Work with each clay, pushing it to its limits, and make notes of your thoughts and observations on paper. You can also create test pieces, such as tiles, bells, or bowls, and fire them according to a standard firing schedule. Examine how the clays behave and how they interact with the glazes you use.